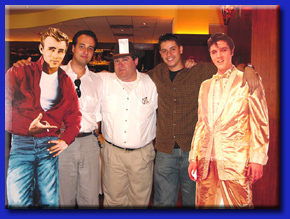 THEY improv provides improv comedy, game shows and murder mystery dinners for entertainment options and activities such as workshops, scavenger hunts, mini-Olympiads, audience Olympiads and mental challenges for a variety of groups looking for new approaches to bringing employees together and fostering a sense of teamwork. This helps them achieve conflict resolution, mutual understanding and create a more successful business environment. Creating trust and success within your organization requires teamwork. Albuquerque corporate team building workshops provided by THEY improv are enjoyable experiences for all. When people have fun, they are more receptive to information and more likely to actively participate. 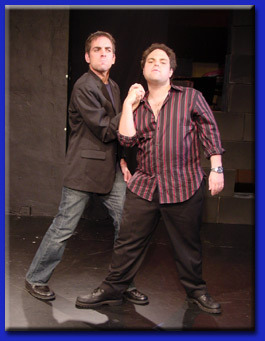 THEY improv professionals come from the conservative business world. Our Albuquerque corporate team building workshops are designed with New Mexico's business needs in mind. We identify the needs of your group by talking to your management and determining the best combination of exercises to achieve your goals. So what are these goals that have to be achieved for successful teambuilding? 1) Mutual understanding: By understanding each other and knowing each others' goals and aspirations, everyone is in a better position to help each other and to motivate team members. 2) Group spirit: A group of individuals just isn't as effective as a group working together. 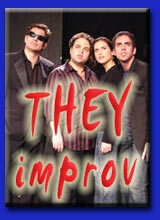 THEY improv works towards creating something of a unified spirit without losing the individuality of members. What are the main questions that management faces today in deciding whether to use a THEY improv Albuquerque Corporate Team Building workshop? Do you have silos? These are groups that work on their own and don't communicate with other groups within your organization. With years of experience providing business consulting services, the staff of THEY improv bring their skills to solve your needs in the ABQ area. Whether you are looking for help in achieving corporate culture change, merger or acquisition assimilation, simple team building workshops, leadership training, employee recognition, bonding, meetings and incentives or skills training, the professionals at THEY improv can assist you in unique ways. We are proud to serve the area casinos including the Route 66, the Hard Rock (formerly Isleta Palace West), the Downs, San Felipe, Santa Ana Star and the Sandia as well as the rest of the entire state, including Las Cruces, Rio Rancho, Santa Fe, Roswell, Farmington, Alamogordo, Carlsbad and practically anywhere else you can think of.